I have developed this fascination with discarded coffee cups. I am starting to see their personalities according to where and how they are abandoned – some are clustered, others are alone. I can envisage a Hannake van Velzen typology emerging here, whereby the animation will really kick in once I have put them together in a collection. This one is a lonely soul at Cannon Street Station gazing out onto the world of work behind him. No doubt by the end of the day, he will have been joined by some mates. I’m hoping to use these images as the basis for a sociological study of surrrogate litter bins. 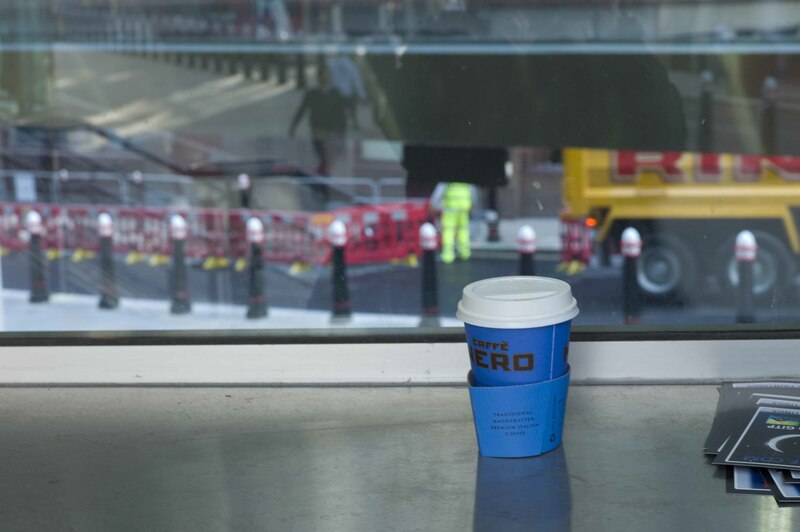 It appears that I’m not the only one fascinated by discarded coffee cups – Richard Wentworth portrays a nice one inverted on railings, and as the discarded coffee cup connoisseur is well aware, railings form a major habitat for the species. It was an interesting day on the coffee cup front – the majority I found were from Caffe Nero. Normally, Starbucks tops the list.